April is Autism Awareness Month, and in 2018, the CDC determined that approximately 1 in 59 children is diagnosed with an autism spectrum disorder (ASD). Boys are four times more likely to be diagnosed with autism than girls. And while most children are still being diagnosed after age 4, autism can be reliably diagnosed as early as age 2. Upper school students at Gateway Academy celebrate National School Choice Week—and the opening of the school’s new Virtual Reality Lab—on Jan. 23. Gateway is one of only five schools in the country specializing in a population of students who are both academically bright and diagnosed with high-functioning autism, otherwise known as Asperger’s syndrome (photo by Tina Greggo, Greggo Photography). Gateway Academy in Phoenix, a private school serving grades K-12, is one of only five schools in the country specializing in a population of students who are both academically bright and diagnosed with high-functioning autism (Asperger’s syndrome). The school has attracted students from as far away as Washington, California, Oregon, Canada, North Carolina, South Carolina, Maryland, Illinois, Minnesota, as well as many parts of Arizona. Gateway Academy has earned a national reputation for providing a holistic educational experience. In January, the school celebrated the opening of a Virtual Reality Lab on campus. The school also offers a World Language Lab teaching 22 languages, Occupational Therapy, Speech Therapy, Equine Therapy, Instrumental Music and Digital Music, and Service Learning (giving back to the community). Gateway Academy will host a student spring fashion show 9 a.m. Tuesday, April 26 in the Atrium on the school campus. The school will offer a small breakfast for attendees and then dozen of students from first through twelfth grade will strut their best self-inspired fashions on the catwalk. The students will be using various materials, including buttons, fabrics, zippers and other props to create their one-of-a-kind look. Gateway Academy has a capacity of 150 students. Enrollment can take place at any point throughout the year. 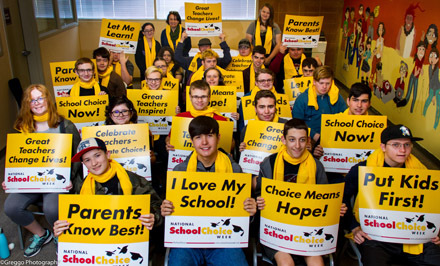 While a private school, Arizona parents can also use the state’s existing Empowerment Scholarship Accounts for Gateway’s tuition, if they feel the school is a better fit than a traditional public school district one. Gateway Academy is located at 3939 E. Shea Blvd. For more information, call 480-998-1071 or visit https://www.gatewayacademy.us.